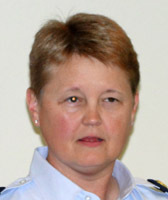 USCG CPT Beverly Havlik, Skipper of the HEALY, the only US Icebreaker operating in Arctic waters. CPT Havlik has had a distinguished career in the Coast Guard, graduating from OCS at Yorktown, VA in 1987 and serving on five other vessels, POLAR SEA in Seattle, SUNDEW in Duluth, MN, PEA ISLAND in Mayport, FL, GENTIAN in Atlantic Beach, NC and MARIPOSA in Detroit, MN. Her duties included ice breaking in the Great Lakes and mid-Atlantic and migrant interdictions in the Caribbean. USCG Captain Beverly Havlik informed us about the recent tour of the US Icebreaker HEALY in Arctic waters. President Elect Chris Monger gave us a rave review of the RI International Convention in Bangkok. Larry May introduce Mayte Flores as our Student of the Month and Year. Scott Sadler and Reuben Ladlad gave us a preview of our annual Charity Golf Classic at Eagle’s Talon Course at Willow Run. Jim Gordon introduced our featured speaker. The HEALY is the only US icebreaker operating in the Arctic and it is equipped to do scientific research as well as break ice. CPT Havlik’s story on Friday was of a first ever winter icebreaking mission in Alaskan waters to supply to town of Nome with diesel and gasoline for the winter. This mission came at the end of a successful 217 day scientific deployment in Arctic waters. During that deployment the HEALY supported a NASA icescape climate change study, a bottom mapping mission in conjunction with the Canadian icebreaker, LOUIS ST LAURENT, a Boundary Current study where Atlantic waters meet the waters of the Pacific, and a winter biomass project involving core samples on the bottom of the Bering Sea. On its way back to Seattle, the HEALY’s deployment was extended. A heavy storm on November 19, 2011 and subsequent cold weather had iced in Nome, Alaska, leaving it with insufficient fuel for the winter. The sea or the air are the only means of supply to Nome and air delivery of the amount of fuel needed would have been cost prohibitive. A Russian flagged tanker, T/V RENDA, was located to deliver the fuel. The RENDA was built to operate in medium ice — say first year ice one meter thick. This mission was the first of its kind so there was no policy or procedure in place. the HEALY and RENDA rendezvoused in Dutch Harbor and proceeded to Nome. The ice sheet had grown considerably since the HEALY passed Nome earlier and ultimately they had to break over 800 nautical miles of ice, all the while maneuvering closely around the RENDA. Since sea ice is always changing this was a substantial challenge. In addition, language was an issue and an Alaska Marine Pilot had to be taken aboard in Dutch Harbor for the final approach and docking in Nome. The fuel was pumped ashore in 60 hours in Nome and the RENDA, much lighter then, presented additional problems in the return portion of the voyage. The mission was highly successful, a testament to CPT Havlik’s skills as well as those of the HEALY’s crew. Those of us who listened to the tale, learned a lot about sea ice and nautical skills! Pledge of Allegiance. Paul Martin introduced visiting Rotarians and guests. Paul has a little work to do on the “You are all…,” but he is young and will no doubt nail it next time. other Rotarians from 200 countries mixed and mingled. At the Convention came the announcement of a challenge grant from the Gates Foundation to really eradicate polio and RI more than met the challenge. Chris also reported that BBRC’s former exchange student, Ta, showed him the sights, including his new recycling/tapioca manufacturing businesses. Chris was so enthused about the Conference that he did not leave any time to report on the finals of the 10K Event. Old Faithful, Larry May, introduced Mayte Flores, our Student of the Month from Eastside Academy. Coincidentally, Mayte was honored by Eastside Academy as its Student of the Year. In attendance to help with these honors were Emma Gross, School Administrator, and Elyse Nicholson, Director of Development. Quite an honor, indeed, and one in which it was BBRC’s honor to participate! John Martinka and Jim Carney provided the words and ceremony to invite BBRC’s newest member, Fred Janssen, into the club. Welcome Fred! Jane Kuechle announced that our Intern, Peter, has found a job as a courtesy clerk at the Overlake Safeway. Peter has been a great helper and greeter at the BBRC, and that experience, along with an internship at the Issaquah Fish Hatchery, let to his job. Congratulations, Peter and much success to you! Talon Course at Willows Run. The date is Monday, July 23. The Golf Committee is still looking for Sponsors and Volunteers so please contact Reuben or Scott to add your support. Steve Lingenbrink reminded that the District Assembly will be held on June 2 beginning at 8:00 am at Seattle University. There will be 21 breakout sessions so chances are good that you will find just the right session for you! What looks like tomorrow’s problem today is rarely tomorrow’s problem when tomorrow rolls around. James Fallows.